To play NOLF in my custom servers, you need to have this NOLF MapPack (compressed size = 570MB). To install the mappack, read the instructions here (provided by the player "Cliché"). that you may be looking for. Please, note that the map Once Upon A Time... was created by a member of the Ego Clan (as most of the other maps used in this server), not by me, but I am replacing some of the songs used in the map (so far four), so this map is not exactly the same as the one distributed by the Ego Clan. And you should also watch the movie, it is a great Western. The Saphire Blue map was created by Spud and is brand new. On July 2014, GameSpy shut down its master servers for good. GameSpy master servers were responsible for showing the online servers available in the in-game server browser. With them gone, online NOLF gaming is at stake. If you try to find online servers, you will not find any. There are a few solutions though: one of them, and the one I recommend, is to use my NOLF Server Status page. Please, read the topic How To Join to learn more. With GameSpy gone, players and hosts have been counting on a few solutions now to play online. Due to the very few players that are still active these days, I decided to create a "Server Status" page that makes it easy for anyone to join an online game. I hope it can help to keep alive the small NOLF community. When you first load the page, it will refresh itself every 30 seconds. After 5 minutes, the auto-refresh will stop. If you decide to use Qtracker, take a look at the mapshot pack that I have created: it allows Qtracker to show, in its Mapshot pane, screenshots of the maps running in the servers. Here is a collection of the in-game NOLF music that I created years ago. These are the songs you listen to when you play the single-player missions. And if you don't have the game, get here the NOLF GOTY Edition. These ISO files were created by me from my original CDs. I run a lot of NOLF servers and, to help me manage them, I wrote some scripts in AutoIT language. There is one file for each server. When I run this file, it will start that server only. Also, there is a "master" file: if I run the master file, it will start ALL my servers, one by one. To fit these files to your needs, you will have to minimally edit the scripts, change the title and settings of the servers, choose your own map rotation list, etc. There are some instructions inside some of the files. They ultimately are plain text files and I recommend using SciTE to open the AU3 files. All the files should be placed inside the NOLF installation folder. Do you like Samba, the Brazilian iconic music? Well, I don't. But, here is an exception: Benito di Paula (née Uday Vellozo). He writes, plays and sings a special kind of Samba. Stupid critics call him "brega" (cheesy). I call him genius. 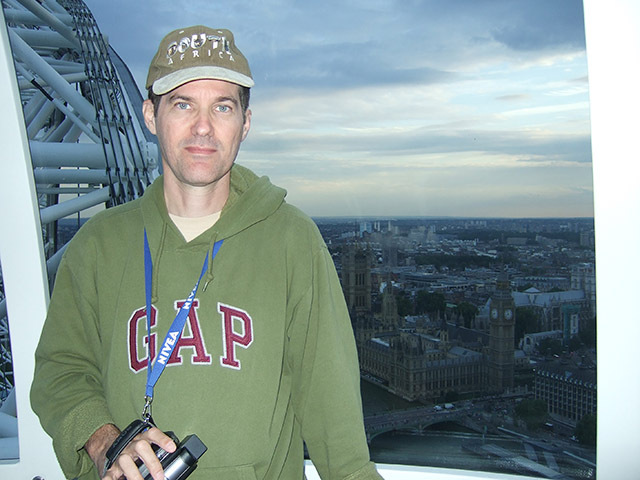 This is me at the top of the London Eye, while on vacation with my wife in UK, some three years ago. Regarding NOLF, I played single player in 2001 and I started playing online only some time between 2006 and 2007. But I am an "on-and-off " player: I retire for long periods of time (last one lasted 2+ years) every once in a while. I have used many nicks when playing NOLF but these days I am mostly "blu-raid ".